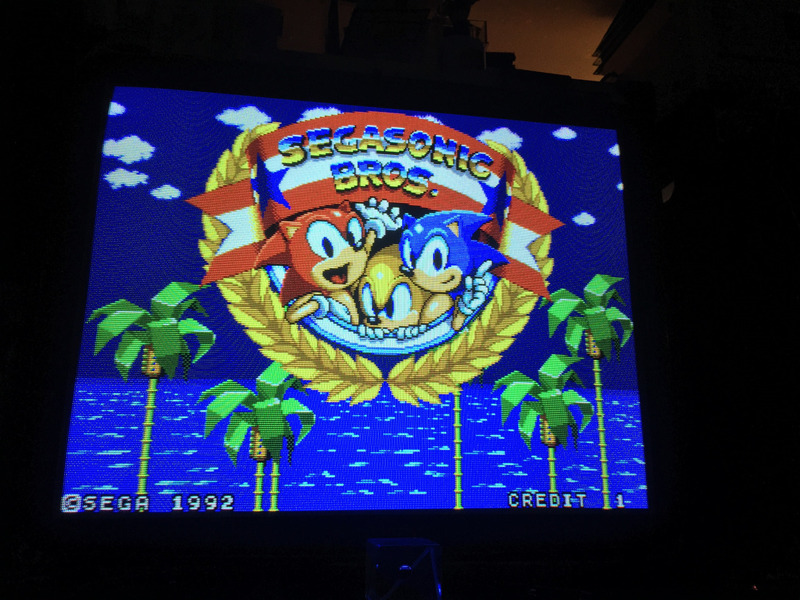 Title screen for SEGASonic Bros.
SEGASonic Bros. was an arcade game that was never properly released. 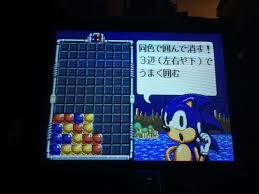 It was a puzzle game where Sonic is joined by red and yellow recolors of himself with differing personalities, the red one being cheerful, and the yellow one more brooding/shy. 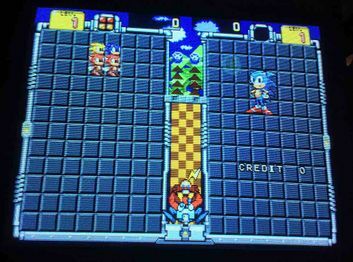 In the game, the player must stack Sonic's copies (multi-colored orbs) together to earn points, similar to Cleopatra Fortune. The game was designed by Fukio Mitsuji, and given a location test. It failed this test and was never released, possibly being marked as one of two unsatisfactory Sonic arcade games in a press release. The game fell into obscurity for many years until Custom Robo's creator Kohji Kenjoh brought it up 20 years later, followed by a few Twitter posts on the game. 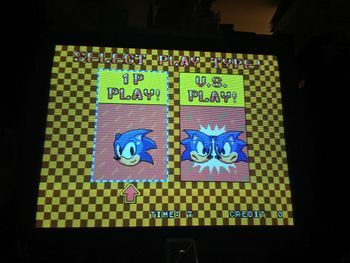 In February 2016, Arcade board collector ShouTime posted screenshots of a working board of SEGASonic Bros to his Tumblr and Twitter, sparking a massive following in the gaming community, as he also teased about dumping the game to the public, but has yet to actually happen. On July 26, 2018, SegaBits (a well known SEGA news reporting website) announced that ShouTime will be providing the playable arcade board at the California Extreme event that will be available from July 28 to July 29, 2018, so it's possible the game resurface on the internet soon. On October 23, 2018, a post was made on Arcade Fixer's Blogspot page about a Japanese collector who has several undumped Sega games, including SEGASonic Bros. The Japanese collector, however, has denied the game being dumped onto MAME with one other game as well (that being Head-On Channel). On November 26, 2018, Arcade board dumper The Guru got his hands on the game and made an update about it, explaining how one of the hoarders of the game tried to scare him to not release the game. 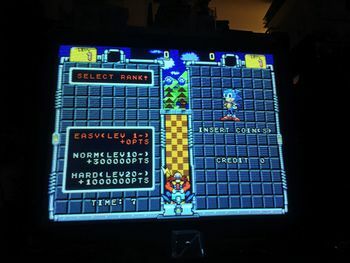 On December 2, 2018, Guru released the SegaSonic Bros. ROM in response to the support for the game added by him on MAME getting removed, and included the driver for it to recompile MAME with support for the game. Gameplay Footage from California Extreme 2018. Direct Capture Footage thanks to NeoHazard. Screenshot of the "How-To-Play" screen. Another screenshot of the "How-To-Play" screen. Sonic Retro article on SEGASonic Bros.
SegaBits Report on the SEGASonic Bros. prototype. Download link for the ROM.